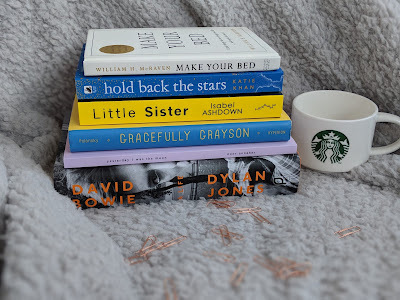 This list isn't particularly long, but I've had barely any time for reading lately and I can't see that changing much in the next year so I went to set myself a realistic goal for the time being - hopefully I will read more books than these, but I figure this is a good enough starting point. If you have any recommendations that I can add to my 2018 to-read list, pleaseeeee let me know! Make Your Bed by William H. McRaven // this was in our #CarnLIVal goody bags, and it's all about little changes you can make to improve your life. It's definitely a coffee table kinda book, one to dip in and out of, and I can't wait to see what's inside. hold back the stars by Katie Khan // another #CarnLIVal offering, this is a Utopian love story - apparently it has a really unique plot and is incredibly complex, which is definitely my sort of book. I plan on taking this one on my next holiday, and I can't wait to get stuck in! Gracefully Grayson by Ami Polonksy // I skim-read this as part of my MRes dissertation, and the chunks I did read I loved so I'm hoping the whole book lives up to that. It's a YA book about a trans girl and I'm excited to finally read it properly. yesterday i was the moon by Noor Unnahar // I've followed Noor on social media for ageeeeesss and her poetry is truly stunning - I'm in absolute awe of the way she manages to put words together in a way that speaks to so many people, and I've had her poetry book on my list for a while so to finally have it is amazing. David Bowie: A Life by Dylan Jones // this was a Christmas present from my mum, and I can't wait to read it. David Bowie has always been such a love of mine, and I already know he led such a remarkable life so I can't wait to learn even more about him. Biographies aren't something I read often, but this one looks like such a treat. What's on your 2018 to-read list?